There's a new trend emerging among Android manufacturers and it hails from the Bear Grylls idea pot. Rugged, water-resistant phones are all the rage, and if you're a manufacturer, you might as well release a device in this class just to join in on the fun. The Hydro Elite isn't Kyocera's first water-resistant phone to splash on the scene, and it's a relatively affordable mid-range phone with a few quirks that may make you think twice about its tempting price point. The Hydro Elite seems to have borrowed the iPhone 5's curved corners and chamfered edges, then bulked up at the gym and swapped out its aluminum backing for a plastic chassis. Despite its compact size, it's a mostly mediocre phone and there's nothing about it that stands out from the rest of the crowd. At 4.82 inches by 2.38 inches by 0.43 inches, the Hydro Elite is smaller and lighter than both the Samsung Galaxy S4 Active and the Sony Xperia Z, two other phones that also tout their waterproof capabilities. It features a 4.3-inch, 1280-by-720 LCD display with 342 pixels-per-inch (ppi), and though its screen is bright enough to be viewed in sunlight, it's hard to see from an angle. Images also appear dull and faded, which becomes annoying if you frequently check up on Instagram and Flickr. Its two main competitors have far superior specs. Both the Galaxy S4 Active and Xperia Z boast quad-core processors, while the Hydro Elite lags behind with a dual-core 1.5GHz Snapdragon S4 and 1.5GB of RAM. It's glaringly obvious that the phone is a bit behind in hardware capabilities when you pan between screens and launch applications, and even its keyboard fails to keep up with fast typing. The camera application and its video-recording abilities make me dubious about relying on the Hydro Elite to document any adventures in the great outdoors. Despite the inclusion of 8-megapixel and 1.3-megapixel rear- and front-facing cameras, the pictures mostly come out grainy and blurry. The camera works best when there's plenty of light out. Lastly, its battery life will make you think twice about its effectiveness out in the wild. It lasted only 3 hours and 53 minutes on its 2100mAh battery pack. If you enjoy daylong hikes, the Hydro Elite will barely make it through half of one. Kyocera has stuck with a mostly untouched version of Android 4.1.2--two releases behind the current version. The only areas where it has inflected its own design is in the notifications panel, the widgets, and the keyboard application. Though Kyocera included things like Quick Settings and a swipe-capable keyboard, the design appears dated. I wouldn't count on it getting timely software updates of any kind. There's a "starter" mode that enlarges the most important icons and simplifies the Android interface. It's a nice feature for parents and novices who are new to the smartphone world, but don't want to rely entirely on seeking constant tech support from their family members. The Hydro Elite's biggest selling point is that it's waterproof for up to half an hour in three feet of water, though this is about the same as the Galaxy S 4 Active and Xperia Z. You wouldn't be able to tell that it's outfitted to swim from its build, however, and there are no flaps or plastic doors to keep any of the ports safe from water. Kyocera also suggests that you allow the phone to dry for some time after you take it out of the water. You also can't use the device while it's submerged. 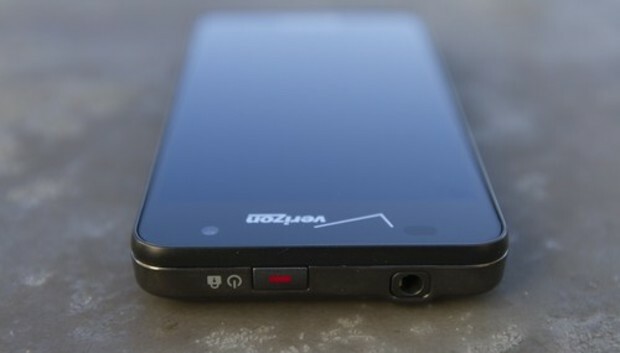 The Kyocera Hydro Elite will only run you $50 on contract at Verizon, or $349.99 off contract. It's an inexpensive, mid-range phone that features the same waterproof capabilities as some more expensive phones, and it hasn't been completely taken over by a hard-to-use custom interface. The low price point may tempt you, but if you really want a good phone that's comfortable outdoors, you'll want to look to its more capable competitors to get the job done right.